Quick dinners are a necessity. 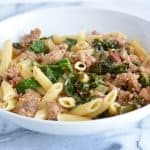 Sausage with garlic Swiss chard over penne is a quick and simple recipe that can be put together in under 30 minutes. I’m a big believer in meal planning. This isn’t just because I’m a dietitian. I’ve been meal planning since I was in college. As a dietitian, I know the benefits of course of home cooked meals, but I don’t want to cook every night. Even if I did there are times when I just can’t. In my CSA share last summer I received a bunch of Swiss Chard. Swiss Chard isn’t a vegetable I have eaten more than one time previously. I don’t like to waste anything, so I was determined to use the Swiss Chard. When I meal plan I always take inventory of what I already have in the pantry, freezer, and the refrigerator. At this particular time, I had sweet sausage in the freezer, Penne pasta in the pantry, and white wine in the refrigerator. It’s so fun when recipes just come together like this! The dish was a hit, so this summer we grew Swiss Chard in our garden. Swiss Chard Nutrition: (1 cup) 7 calories, 0.1 gm Fat, 0 mg Cholesterol, 77 mg Sodium, 136 mg Potassium, 1.3 gm carbohydrates, 0.6 gm Protein. 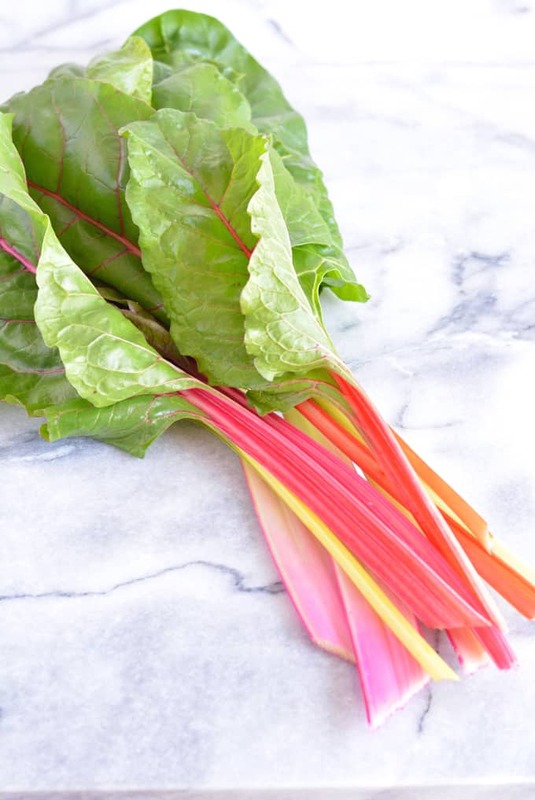 Swiss Chard is an excellent source of Vitamin K, A, and C.
Note: Anyone taking Coumadin should limit or avoid eating Swiss Chard because of the Vitamin K content. This recipe was developed one day when I was trying to put together a meal with just ingredients I had at home. 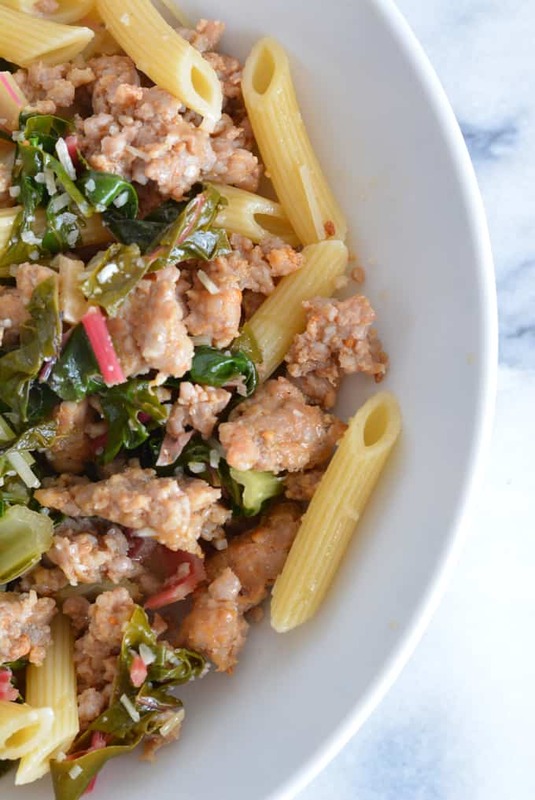 Sweet sausage pairs so well with garlic Swiss Chard. 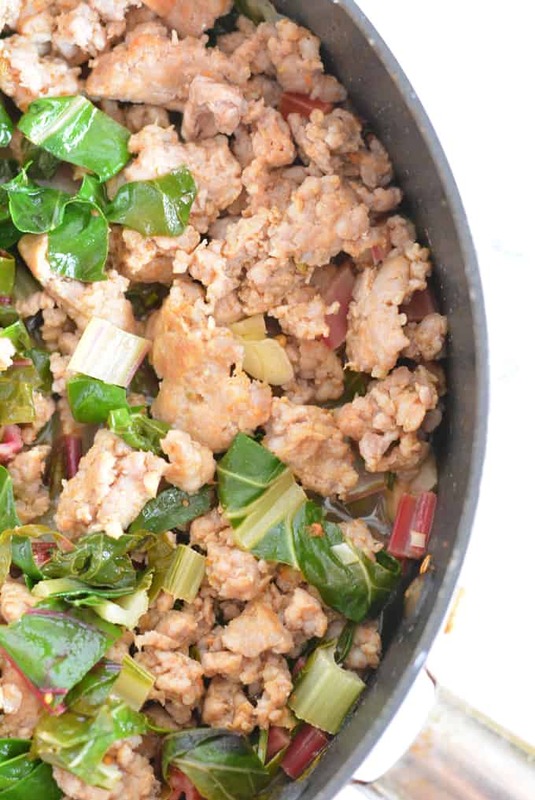 In a large saute pan cook sausage over medium high heat until fully cooked, about 3-5 minutes. Remove sausage from pan and keep warm. Add garlic to saute pan and cook for about 1 -2 minutes until tender. Next add in Swiss chard, cooking for 3-4 minutes until tender. Add wine, bring to a slow boil and let sauce cook for about 1-2 minutes. Add cooked pasta and toss to mix ingredients. 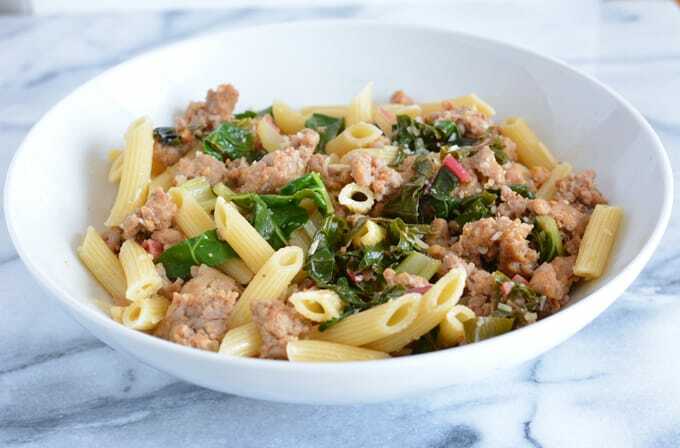 If you have the need to lower carbs just eliminate the pasta! This looks so good, and I love when pantry and fridge ingredients come together. I love that CSAs can introduce new ingredients like that! And that having these ingredients on hand spawned such a yummy combo!! I love CSA’s because of the different veggies that I would get to experiment with.